One of the UK’s leading producers of cleaning products is targeting substantial growth in its commercial hygiene business after launching a new professional dishwasher range. 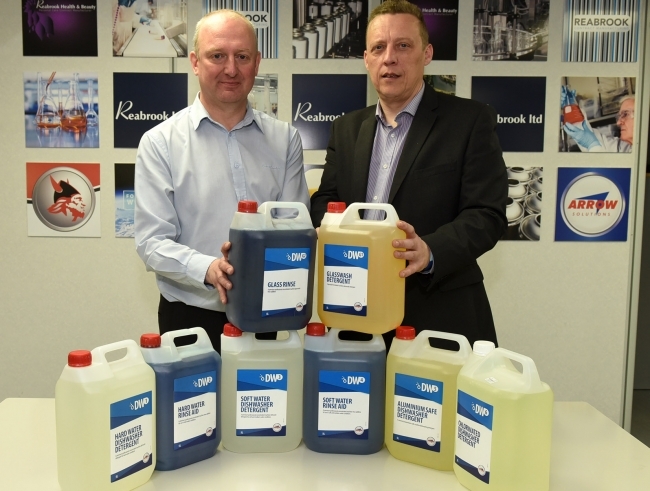 Arrow Solutions, which manufactures the products at a state-of-the-art facility in the East Midlands, unveiled the ‘DW’ brand recently, featuring five high performance dishwasher detergents and three rinse aids. It is part of a concerted marketing campaign to secure more than £1.5m of additional business, an approach that is already working, with the company recently winning long term contracts with hotel groups, restaurant chains and schools and universities. “Our dishwasher products have been winning a lot of admirers over the last eighteen months for their performance and how competitive they are against their rivals, with sales up about 15% across the year,” explained Shaun Thomas, Head of Sales Commercial Hygiene. He continued: “DW has met this need and we are reinforcing the launch with a dedicated brochure, splash pages on the website and a social media campaign that is already generating new leads for us. Arrow Solutions’ dishwasher detergents and rinse aids are specifically designed to cover all aspects of commercial dishwashing, from hard and soft water areas to specific requirements such as aluminium safe and glass washer products. All products are manufactured in the UK and have been formulated to provide optimal dishwasher performance and a ‘clean first time’ guarantee. “Recent new customers have been very impressed with how the DW range performed against more recognised market brands,” explained Jeremy Moore, Product Manager at Arrow Solutions. Arrow Solutions is currently rebranding all the other areas of the commercial hygiene business, including kitchen, housekeeping and washroom.